Batwoman making a decidedly dramatic entrance. Though film and television studios have figured out how to create convincing, life-like dragons and turn people into legendary gods using VFX, it’s all too common to find that the budgets for the hair and makeup department don’t account for good-quality wigs. We can’t let that happen with the CW’s upcoming live-action Batwoman. A lot of shows can get away with this injustice without causing too much of a dustup (there are, of course, exceptions), but with the CW’s upcoming Batwoman series, that’s really not the case. When Kate Kane makes her Arrowverse debut, it’s almost certain she’ll be sporting her signature red wig from the pages of DC Comics. But it can’t just be any wig—it’s gotta be a damned good one. Much like a stain on an otherwise pristine shirt, a bad wig is easy to spot and almost impossible to miss once you’ve noticed it in movies and TV shows grounded in reality. This isn’t always a huge problem, in part, because people wear questionable wigs in the real world all the time. When it comes to genre, though, especially genre that’s working to make the fantastical seem realistic, details like a wig’s quality that might otherwise go overlooked suddenly become glaringly obvious. Take, for example, the set of wigs Emilia Clarke wore for Game of Thrones’ first seven seasons before she ultimately decided (and regretted) to dye her hair blonde for the show’s final season. They’re pretty and intricate, sure, but they read less like Daenerys’ actual hair and more like something one might have bought from Kings Landing’s equivalent to a beauty supply store. The same goes for Medusa’s hair from Inhumans, which...well, we just don’t speak about that anymore. Unlike those hair pieces that viewers are to believe are their respective characters’ real hair, the sanguine shock of red waves people most commonly associate with Kate Kane is actually supposed to be a wig that she dons as part of her Batwoman costume. Batman chastising Kate for wearing her hair long. Kate’s wig actually plays a rather important role in writer Greg Rucka and illustrator JH Williams III’s “Elegy” arc in Batwoman, which finds Kate on the hunt for the fanatical leader of the Religion of Crime cult. 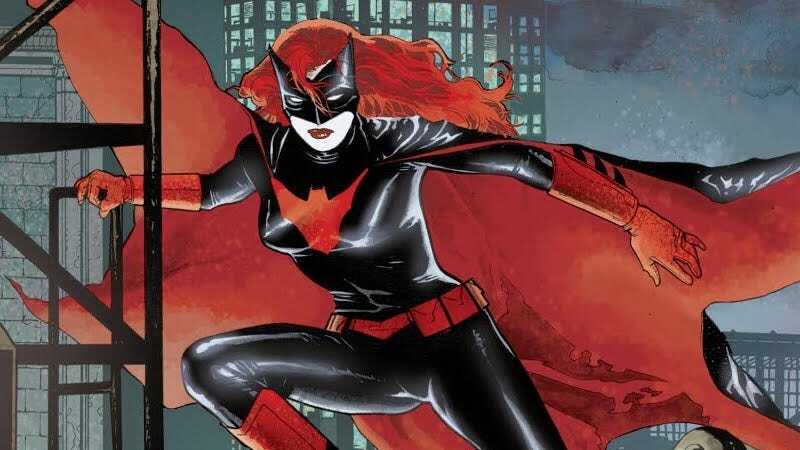 Batwoman takes a moment atop an apartment in Gotham to discuss the cult’s renewed activity with Batman and before the Dark Knight vanishes into the shadows, he advises her to cut her hair, reasoning that it would put her at a marked disadvantage during a fight. In typical Kate fashion, Kate smirks and takes off on her motorcycle before returning to her base—where we can see that her “hair” is actually affixed to her mask. The particular exchange is important for a couple of reasons. First, in making a point of showing readers Chekov’s wig, Rucka and Williams telegraph that it’s set to play an important role in the story later. Second (and perhaps even more importantly), the panel establishes that Kate’s wig was convincing enough to fool Batman. If Batman can’t clock that you’re wearing a wig, then nobody should be able to. The CW could, one imagines, just treat Kate’s wig much in the same way that everyone treats Kara Danvers and Clark Kent’s glasses like the super-convincing disguises they aren’t. But where’s the fun in that? More to the point, though, Kate’s wig does occasionally come off during fights because whoever she’s fighting assumes that it’s her real hair, which gives her a unique advantage over them. Batwoman escaping the clutches of a psychopath who incorrectly thought her wig was her actual hair. Of course, Kate’s wig is far from the most important thing about her, but it’s something that encapsulates what makes the character such a refreshing and unique member of the Bat Family. Her style of deception is one that sometimes banks on her foes’ sexist assumption that she’s not the deadly threat she most certainly is. She disabuses them of that notion with her fists, to be sure, but not before letting them become confident that their ideas about her are accurate. There are a number of ways to incorporate that aspect of her character into the CW’s show, but the most iconic (and comics-accurate) definitely involves getting that woman the wig to end all wigs.